DOVER, Del.—When Joey Logano sets a record, he does it in style. 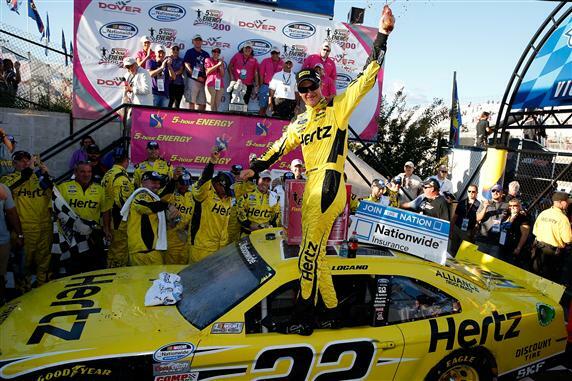 Logano didn’t just win Saturday’s 5-hour Energy 200 NASCAR Nationwide Series race at Dover International Speedway. He crushed the rest of the field in taking the checkered flag in a record four straight events at the Monster Mile. No other driver has ever won four straight races at Dover in any of NASCAR’s top three national series, and Logano accomplished the feat decisively, finishing 14.590 seconds ahead of runner-up Kyle Larson. Kevin Harvick ran third, more than 24 seconds back, and Brian Vickers came home fourth. Logano, Larson, Harvick and Vickers were the only drivers on the lead lap at the finish. The victory was Logano’s third this season and the 21st of his career. It was also the series-best 11th victory for the No. 22 Penske Ford, a car shared by Logano, Brad Keselowski, AJ Allmendinger and Ryan Blaney. In post-race inspection, NASCAR determined that the ride height of Logano’s race-winning car was too low in front on both sides. The sanctioning body will review the infraction at its weekly competition meeting, and penalties, if any, will be announced next week. Arguably, Kyle Busch had the fastest car—at least during the early portion of the race-but Busch stayed on the track under the first two cautions, both of which fell within the first 35 laps of the race. When a third caution failed to materialize, Busch was forced to pit under green on Lap 87, leaving him unable to complete the race without stopping again. Logano, on the other hand, brought his No. 22 Ford to pit road on Lap 37, under the second caution, and made his second stop, under green, on Lap 116. That left him within the window of finishing the race without another trip to pit road. On the Lap 37 stop, crew chief Jeremy Bullins took the time to make adjustments that corrected a loose handling condition, and from that point on, Logano’s car was unbeatable. The 22-year-old driver led 106 of the 200 laps, including the last 59. When the pit stops cycled out by Lap 124, Busch held a lead of almost 10 seconds, but Logano, on fresher tires, cut into the advantage in large chunks. On Lap 142, Logano caught and passed Busch’s No. 54 Toyota and pulled away to a lead of more than four seconds by Lap 175. “When we came out on new tires (on Lap 117), I radioed to Jeremy, ‘The car’s right on. It’s right where I need it to be,'” Logano said. “When your car’s driving good here, and you have exactly what it needs, when you get to lapped traffic, it doesn’t even slow you down. With the race still under green on Lap 176—and six other cars on the lead lap-Busch was forced to pit and dropped to 14th, one lap down. He finished eighth. A pit road speeding penalty incurred on Lap 117 cost Sam Hornish Jr. most of his series lead. Hornish finished 17th and left Dover four points ahead of sixth-place finisher Austin Dillon, who trimmed 11 points from Hornish’s advantage entering the race. With the final 160 laps run under green, team’s had limited opportunities to make strategic calls and adjustments that might have counteracted Logano’s advantage. Harvick said slick, treacherous conditions actually contributed to the long green-flag run to end the race. “When the cars are really hard to drive, you have to slow ’em down, and when you really have to slow ’em down, there’s a lot less chance for things to happen,” Harvick explained. “Nothing surprises me. I know in the (Sprint) Cup series we’ve run races from start to finish without a caution. 1. (1) Joey Logano(i), Ford, 200, $49230. 2. (17) Kyle Larson #, Chevrolet, 200, $41322. 3. (8) Kevin Harvick(i), Chevrolet, 200, $24265. 4. (11) Brian Vickers, Toyota, 200, $27696. 5. (12) Elliott Sadler, Toyota, 199, $25821. 6. (3) Austin Dillon, Chevrolet, 199, $24671. 7. (9) Parker Kligerman, Toyota, 199, $22256. 8. (5) Kyle Busch(i), Toyota, 199, $18110. 9. (18) Trevor Bayne, Ford, 199, $21621. 10. (6) Mike Bliss, Toyota, 199, $22446. 11. (10) Brian Scott, Chevrolet, 199, $20971. 12. (14) Justin Allgaier, Chevrolet, 199, $20846. 13. (7) Brad Sweet, Chevrolet, 198, $20746. 14. (15) Michael Annett, Ford, 198, $20621. 15. (13) Regan Smith, Chevrolet, 198, $21521. 16. (19) Cole Whitt, Toyota, 198, $20471. 17. (2) Sam Hornish Jr., Ford, 198, $20596. 18. (4) Alex Bowman #, Toyota, 197, $20346. 19. (20) Landon Cassill, Chevrolet, 197, $20296. 20. (23) Jeremy Clements, Chevrolet, 197, $20921. 21. (22) Mike Wallace, Chevrolet, 196, $20191. 22. (21) Travis Pastrana, Ford, 196, $20091. 23. (24) Joe Nemechek, Toyota, 196, $20016. 24. (16) Nelson Piquet Jr. #, Chevrolet, 194, $19966. 25. (38) TJ Duke, Ford, 191, $20391. 26. (31) Eric McClure, Toyota, 189, $19866. 27. (34) Morgan Shepherd, Chevrolet, 177, $19816. 28. (27) TJ Bell, Chevrolet, 162, $19741. 29. (33) Joey Gase, Chevrolet, Rear Gear, 107, $19666. 30. (25) Blake Koch, Toyota, Handling, 85, $19916. 31. (29) Carl Long, Dodge, Transmission, 74, $19566. 32. (30) Ryan Ellis, Toyota, Brakes, 60, $13315. 33. (39) Brad Teague, Toyota, Parked, 58, $13245. 34. (36) Donnie Neuenberger, Ford, Accident, 33, $19406. 35. (28) Jeff Green, Toyota, Vibration, 13, $13155. 36. (35) JJ Yeley(i), Chevrolet, Overheating, 9, $12260. 37. (37) Chase Miller, Chevrolet, Handling, 8, $12240. 38. (26) Josh Wise, Chevrolet, Transmission, 7, $12176. 39. (32) Danny Efland, Chevrolet, Vibration, 4, $12075. Average Speed of Race Winner: 131.219 mph. Time of Race: 1 Hrs, 31 Mins, 27 Secs. Margin of Victory: 14.590 Seconds. Caution Flags: 2 for 8 laps. Lap Leaders: J. Logano(i) 1-18; K. Busch(i) 19-86; J. Logano(i) 87-115; M. Bliss 116-117; C. Whitt 118-120; K. Busch(i) 121-141; J. Logano(i) 142-200. Leaders Summary (Driver, Times Lead, Laps Led): J. Logano(i) 3 times for 106 laps; K. Busch(i) 2 times for 89 laps; C. Whitt 1 time for 3 laps; M. Bliss 1 time for 2 laps. Top 10 in Points: S. Hornish Jr. – 989; A. Dillon – 985; E. Sadler – 947; R. Smith – 946; B. Vickers – 942; J. Allgaier – 919; B. Scott – 916; T. Bayne – 903; K. Larson # – 864; P. Kligerman – 820.